Has anyone tried to advertise your business with a sticker on the camera? 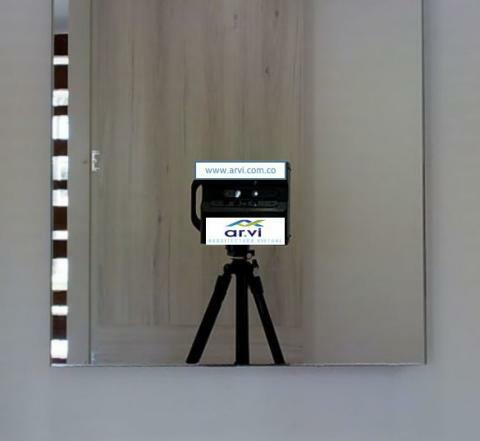 So when you look at the MP camera in front of a mirror at the model, clients will see your company logo or brand. For people here in the U.S. uploading tours to the Multiple Listing Service (how Realtors share their properties for sale with other Realtors), this would be a problem - MLS does not allow any kind of "branding" in the images we upload. Would´t be a problem in the UK, but it would be considered blatant self promotion and I would personally not do it. I do have some small stickers, business card size, on my camera, not for the "mirror shots" but rather when busy shooting some public accessible spaces, people can get my contact details without having to come up and ask. In my opinion the camera in the mirror should be as less noticeable as possible, so placing stickers like in the photo would causa some kind of a shock to anybody exploring the space. If you want to advertise your brand you could use WP3D Models solution that lets you place your logo over the images in the lower left corner of the screen in a very low key but effective way. It worked for me and I have received a couple of contacts coming from people that saw my brand on a model. A small sticker as @JC3DCX mentions is a very good idea. Nothing invasive but effective when working in public acccessible spaces. Particularly because the camera atracts attention by itself. Over the last 100 scans I've done, I've only shown a mirror once or twice. You can almost always find ways to avoid them. It's a huge distraction to see the camera in the mirror and putting some sticker on the camera makes it even more distracting and tacky.